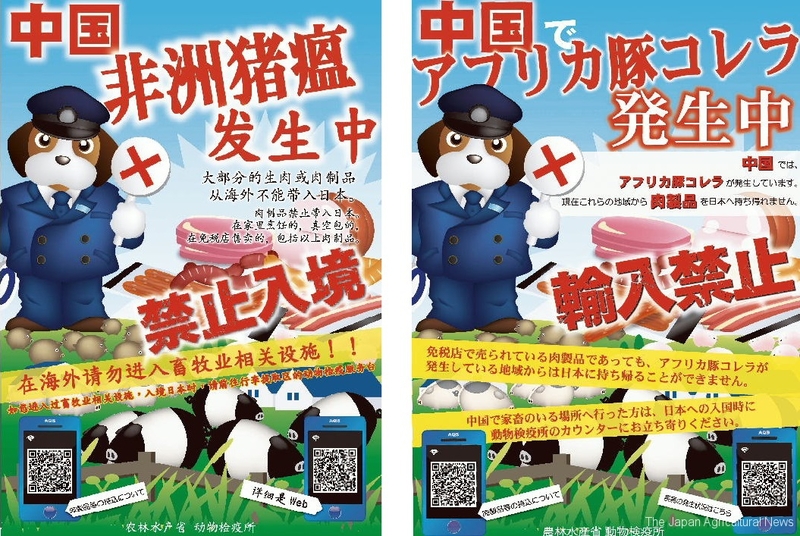 Japan’s new poster campaign highlights risks of infected pork imports from China in two languages – the Japanese and the Chinese. TOKYO, Aug. 22 ― Following outbreaks of deadly African swine fever (ASF) in China in early August, Japan is enhancing its disease surveillance and biosecurity controls at points of entry to the country. 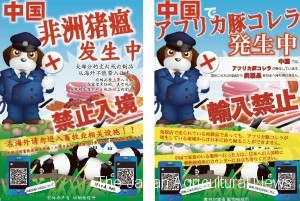 The Japanese agriculture ministry has released a poster, which highlights risks of infected pork imports from China in two languages — the Japanese and the Chinese. The highly contagious disease is not harmful to humans but is often fatal to pigs and impossible to vaccinate against. Four cases of the highly contagious disease have been reported since early August in China: in northeastern Liaoning province, Henan in central China, and in Jiangsu and Zhejiang in eastern China. As concerns have grown over the rapid onset of the deadly disease in China, experts now warn the deadly pig virus may spread to other Asian countries anytime. These might be brought into Japan by individuals as personal imports.